Gorsehill Abbey Farm uses a Tinytag data logger for essential temperature monitoring during the cheese making process. Conditions are monitored by the Tinytag View 2 data logger during the production of organic cheese, and record pasteurisation temperatures in line with food safety regulations. Gorsehill Abbey Farm is an organic dairy farm in the Cotswolds which produces a number of speciality cheeses. Their range includes a 'Fromage Frais' and three 'Cotswold' fresh soft creamy cheeses - Natural, Peppercorn, and Herb - as well as a number of fresh moulded and ripened cheeses. The organic cheese is made using the milk from the organic dairy herd. 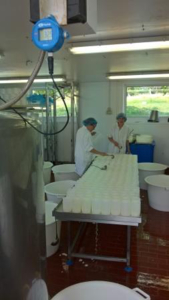 As part of the cheesemaking process, it needs to be pasteurised, and then cooled and cultured at specific temperatures for a certain length of time. A record of the pasteurisation temperature and time is required for food safety regulations, as well as a record of the cheesemaking temperature and time for the farm's own reference. A Tinytag View 2 data logger, which incorporates a digital display, is used to monitor the milk temperature. Michael Stacey, Owner of Gorsehill Abbey Farm chose the Tinytag for its ease of use, accuracy and value for money. It was also important to have a logger that displays current readings as well as recording over time. Michael comments, "Tinytags must be good, we're still using them after many years!"